Description: Detailed large political map of West Virginia showing cities, towns, county formations, roads highway, US highways and State routes. West Virginia is an American state in the Mid-Atlantic, Upland South and Appalachian parts of the country. Charleston is the largest city as well as the capital city of this state. On the northeast side of this state there is Maryland and Pennsylvania, on its northwest side is Ohio, on the southwest of West Virginia is Kentucky and on the southeast side it is surrounded by Virginia. 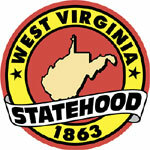 West Virginia is well-known for its labor history, coal mining industries and natural beauty. The state is also popular for its recreational activities like hunting, mountain biking, fishing, whitewater rafting, hiking, climbing, skiing and caving. About three-fourth of the state is located within the Allegheny Plateau and Cumberland Plateau regions. According to the census conducted in the year 2005, it was reported that they are about 1,816,856 people living in West Virginia. Out of this number, about 1.1% of the residents were born in other countries. Most of the people speak in English at home and only about 2.7% speak in other languages when they converse with family members. The female population is more than the male population and the ratio of female to male is 51:49. The main ethnic groups in West Virginia are English, American, Italian, German and Irish. Physical map and map image of West Virginia.